What's best to eat for recovery after a hard workout? That's what soccer players, marathoners, and body builders alike repeatedly ask. They read ads for commercial recovery foods that demand a 3-to-1 ratio of carbs to protein, tout the benefits of a proprietary formula, or emphasize immediate consumption the minute you stop exercising. While these ads offer an element of truth, consumers beware: engineered recovery foods are not more effective than standard foods. 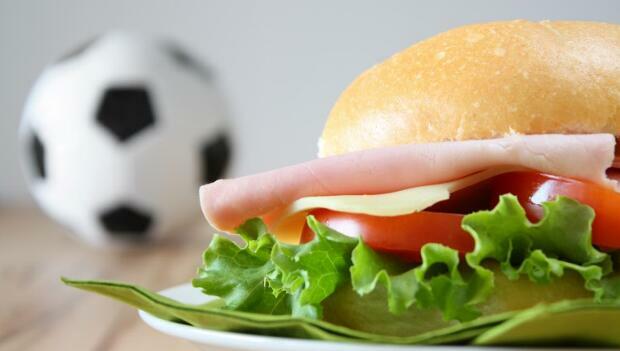 The purpose of this article is to educate you, a hungry soccer player, about how to choose an optimal recovery diet. Which Players Need to Worry About a Recovery Diet? Too many athletes are obsessed with rapidly refueling the minute they stop exercising. They are afraid they will miss the one-hour "window of opportunity" when glycogen replacement is fastest. They fail to understand refueling still occurs for several hours, just at a slowing rate. Given a steady influx of adequate carb-based meals and snacks, muscles can refuel within 24 hours. If you have a full day to recover before your next training session or game, or if you have done an easy (non-depleting) workout, you need not obsess about refueling immediately afterwards. The sooner you consume carbs to replace depleted muscle glycogen and protein to repair damaged muscle, the sooner you'll be able to exercise hard again. Over the course of the next 24 hours, your muscles will have lots of time to replenish glycogen stores. Just be sure to repeatedly consume a foundation of carbohydrates with each meal/snack, along with some protein to build and repair the muscles. For example, chocolate milk or a fruit smoothie are excellent choices. For moderate exercise (about one hour a day), 2.5 to 3 grams of carbs per pound. For endurance exercise (about 1-3 hours a day), 2.5 to 4.5 grams of carbs per pound. For extreme exercise (about 4-5 hours a day), 3.5 to 5.5 grams of carbs per pound. For example, a 150-pound soccer player doing extreme training should target 500 to 800 grams of carbs per day (2,000-3,200 carb-calories). That's about 500 to 800 carb-calories every four hours during the daytime. What Are Some Good Carb-Protein Recovery Foods? Do NOT consume just protein, as in a protein shake or protein bar. Protein fills your stomach and helps build and repair muscles, but it does not refuel your muscles. Your muscles want three or four times more calories from carbs than from protein. If you like the convenience of protein shakes, at least add carbs to them. That is, blend in some banana, frozen berries, and graham crackers. Keep in mind that recovery calories "count." I hear many weight-conscious soccer players complain they are not losing weight despite hard workouts. Perhaps that's because they gobble 300 or so "recovery calories" and then go home and enjoy a hefty dinner. By organizing your training to end at mealtime, you can avoid over-indulging in recovery-calories.